A Discuss these questions with a partner. 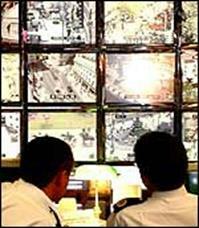 1 Are there a lot of CCTV (closed circuit television) cameras in your town? 2 Where do you usually find them? 3 Do you think they are a good thing? Why? Why not? 4 How do they make you feel? 7b Zeina is a student in London. Read her essay about CCTV cameras. Does she mention any of the things you discussed? 7d Where can you find these things in the essay? Write I for introduction, MB for main body and C for conclusion.